England hero Jesse Lingard has been in flying form at the World Cup! Here are some tips and tricks, plus an awesome drill to master extreme agility like the Man. United superstar! Awesome England and Man. 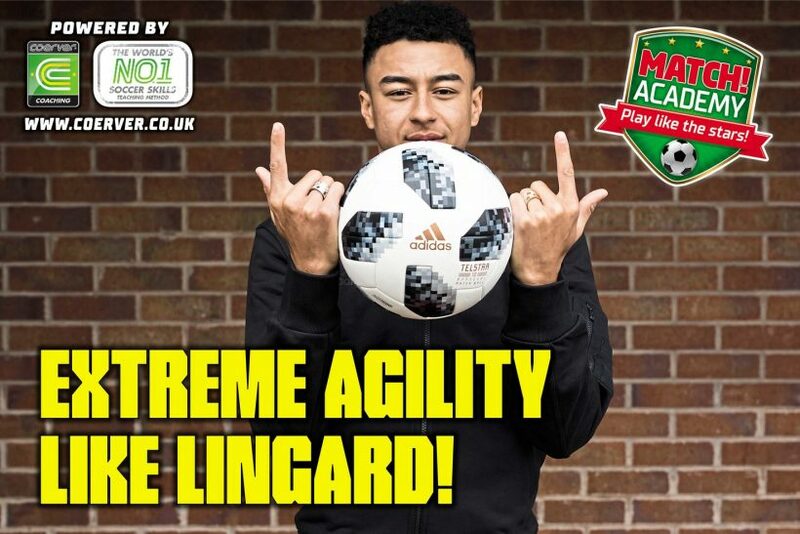 United superstar Jesse Lingard is ace at weaving his way past any defender! To skin your man like JLingz, keep the ball close, have soft knees and sneak a look so you can dance past oncoming opponents at will! The England hero is wicked at creating space for himself and his Three Lions team-mates. Stay light on the balls of your feet so you can lose your marker in a flash! You can check out Lingard doing this against Belgium this week! Start on the left side, perform sole dribble cuts through the flat discs, stop the ball and turn right at the last disc. Now, sprint around the pop-up cone, and weave in and out of the flat discs until you get back to the ball. Perform sole dribble cuts back through the flat discs, stop the ball and turn right at the last disc.